Recorded at The Bomb Shelter, Nashville, TN. “Ben Sparaco is a young guitarist, singer, and songwriter living in Nashville, TN with a sound that combines energetic and soulful guitar playing with a unique blend of rock, soul, blues, jazz, and folk music. At only 19 years old he has begun to make a name for himself around the country playing with various acts including The Ben Sparaco Band. Starting at the young age of 11, Ben began playing guitar with cover bands around his native Broward County, Florida. Not long after, he found the sound he had been hearing in his head in blues music from the likes of B.B. King, Elmore James, Freddie King, and Muddy Waters. Following this music forward in time, he discovered the Allman Brothers Band, which he still cites as one of his main influences. By the time he was 15, Ben began playing his original music to audiences around south Florida with his first original band. Throughout his time in high school, he began to hone his skills on slide guitar while simultaneously delving into a study of various traditional music styles such as Gospel, R&B, Eastern Classical (Sarod), American and European Folk, Bluegrass, and Jazz. 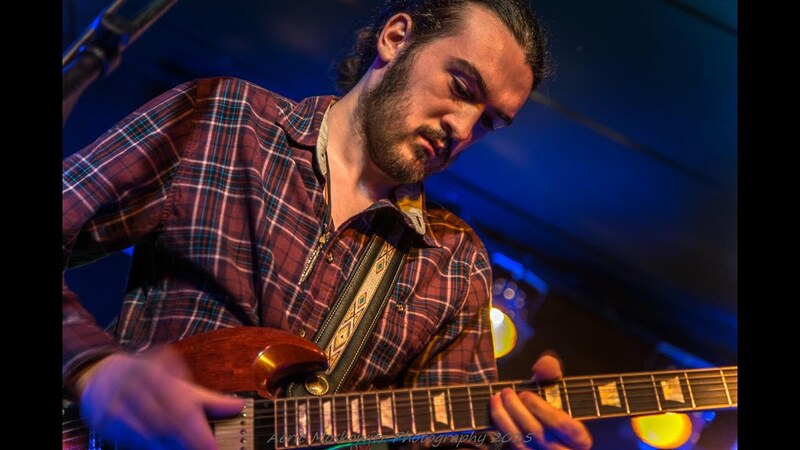 In early 2015 Ben began a stint as a full-time lead guitarist with south Florida jam legends Crazy Fingers; a gig which exposed him to the music of the Grateful Dead until his full time departure in August of 2015. On August 18th, 2015- the night before moving to Nashville, TN- he assembled his own band and welcomed many guests to the stage of the Funky Biscuit in Boca Raton, FL. This band would undergo some personnel changes and quickly prove to be an in-demand musical force in the southeastern United States and beyond and is now called the Ben Sparaco Band. In May of 2016, the Ben Sparaco Band’s debut EP “Bring The Jubilee” was released. After a busy summer of touring, Ben recorded his debut album “Wooden” in the fall of 2016 in Nashville, TN. Produced by Ross Holmes (Bruce Hornsby and The Noisemakers, Warren Haynes, Mumford and Sons), the record displays a decided shift in Ben’s sound towards a more string-based Americana sound mixed with his wide-ranging jazz, rock, and soul influences. Wooden is due out January 13th, 2017. Immersed in the national jam scene, Ben has had the opportunity to share the stage with members of The Allman Brothers Band, Dead and Company, North Mississippi Allstars, Warren Haynes Band, Susan Tedeschi Band, Jerry Garcia Band, Sister Sparrow and The Dirty Birds, Devon Allman, Matt Schofield, The Heavy Pets, Roosevelt Collier, Buffalo Philharmonic Orchestra, and more at venues across the country”. The maturity of Ben Sparaco – a good album title, no?! – is not just reflected in his professionalism but the music and attitude to his craft. Sparaco is not even in his twenties but has already been performing for years now. Folk, and sub-genres of, are seeing a lot of young artists (teens and early-twenties) emerge who are showing their peers how it should be done. A little diversion coming up: this was motivated by a recent letter/statement from Björk – when the press criticised her D.J. sets; stating it was hard to see her and she did not interact with the audience – who labelled such complaints/demands sexist. Women in music are expected to bleed their hearts out (the Icelandic genius described it in more vivid, chest-opening terms) and surrender – talking about their cheating boyfriends and not allowed to sing about science, philosophy or other subjects. Men, by comparison, are allowed this creative variation and do not have limited expectations placed on their shoulders. Maybe a parable, but one can look at Folk and how it contrasts the mainstream/Pop-driven artists. There, there is a proliferation of fake sounds and romantic catastrophism. Its representatives, both male and female, are obsessed with retribution, self-flagellation and over-reactive heartache mandates. Maybe there is something about Folk/Americana that attracts a more level-headed, mature songwriter. I noticed this when reviewing certain artists this year: you get greater intelligence, wisdom and originality. Of course, there are Pop stars and Rock acts who do not expend all their energy on tired themes and predictable love songs. Sparaco is a young man but has the shoulders and mind of a much older (experienced) musician. You get plenty of introspection and longing but gone are the songs that villainise a sweetheart and rip the heart to pieces. I always look for musicians that go beyond easy possibilities and dig deeper for their inspiration. That is not to say Ben Sparaco – not at this stage at least – is negating relationships and blame culture. You get songs about passion and bonds but there is never that juvenile sensibility. After a long time with U.K.-based artists; it is great being back in the U.S. and discovering an artist who brings me to a veritable wonderland of great music – Nashville in Tennessee. Sparaco has recorded and based himself here and that is understandable. It is not often I get to look at any music/musicians that have been born from Nashville. Although there are Country shades in his music; there is a variation of genres including Folk, Rock and Soul. The Tennessee city is a desirable hub for new musicians. There, one is afforded access to myriad venues, bars and contemporaries. It such a lively and bustling area: often overlooked in favour of New York and Los Angeles. If Tennessee’s are insane Trump supporters: at least their music and musicians are a little more appealing, palatable and wise. To be fair, Nashville is in Davidson County: Hilary Clinton gained a majority vote there so I can limit my judgment of Tennessee to counties other than Davidson and Shelby. Getting back on track and it seems Nashville is becoming more and more attractive to artists – not just here but all around the world. It is not as crowded and harsh as New York (or the reputation many give it) and better, in some ways, to L.A. There are friendly citizens and some wonderfully varied areas. I know musicians who have rocked up to Nashville and all say the same thing: it is a city nobody wants to leave and instantly feels at home in. It is not a surprise to find Sparaco thriving and succeeding here. Armed with a collection of gorgeous songs – already a string of tracks under his young belt – there is also a great local scene there. To the north-west (of Tennessee) is Illinois; to the south-west Mississippi; Florida is to the south-east. Between those three states, you have cities like Chicago, Jackson and Miami – New Orleans is directly south of Jackson and another wonderful region. What I mean is how Sparaco has this world of opportunity in a commutable distance. If California has Nevada on its doorstep – New York has Toronto nice and close – then there are even more choices for a Tennessee resident. Sparaco and band have been hitting Florida and Tennessee; they have been getting around the South and bringing their unique brand of music to the good people. I am fascinated by U.S. music and how it changes from state to state. When Wooden arrives (the debut from Sparaco) that will be met with a series of tour dates around the tri-state area but further afield. He will want to focus on Christmas for now but January is sure to be a busy one – a great way to kick-off the New Year. I feel Nashville is too associated with Country music and few understand how diverse and utilitarian the music scene is there. To say Nashville is only Country is to say London is only Rock. It is a narrow (and false) assumption that will see many timid when exploring. I would urge people to commit to Ben Sparaco but other musicians around Tennessee. I shall come to Sparaco’s music but it is interesting placing Nashville and just how many fantastic musicians play there and how convenient it is placed with regards musical states. In order to get some perspective and clear impression of Sparaco’s present, we must look back and see how he has developed as an artist. Bring the Jubilee is the E.P. (released last year) that shows just how impressively he started. Walk on the Levee twangs with Blues strings and Rolling Stones-like licks. Flourishes and ripples cascade, kiss and breathe lustfully. Funky guitars and percussion combine with whirling organs and spirited stomp. A storm comes across the lake; the hero needs to pack his bags – a gravelled voice and a real gutsy performance make it the song it is. Constant stutter, skip and energy can be discovered: you are helpless to resist its sheer charm, kick and energy. One is compelled to bob their head and immerse yourself in the song. If the storm comes “it’ll make a change”. You speculate whether it is a physical, literal storm or an emotional one. I feel there is a mixture of the two and a need to evade coming clouds and find fulfilment and self-improvement. An exceptional blend of Blues and Folk-Rock mean it will appeal to lovers of 1960s-‘Stones and more modern examples. It is a really developed and accomplished song – it could easily fit into the catalogue of any decades-old band. Ghost of a Self is a more traditional Country-Rock track and still has that solid core and powerful vocal anchoring everything. Lovely interludes brim where guitar stands out and shines. I can hear a definite sound of America and Nashville. It has its heart beating in that landscape but definitely appeals and cross-pollinates. The guitars shine and the delicious licks are not bashful when getting into the earlobes (and other more visible regions). The songwriting looks at humanity and deeper issues but never truly exposes its meanings. The lyrics keep oblique and can be open to interpretations. Hammer That Nail uses hammer-and-tool imagery to look at love or support. The heroine, it is said, can hammer the nail as hard as possible; the hero will hold the picture up and not let it fall. (The song) maybe looks at stress and struggle and being a shoulder and support; emotional dependence and a release for inward rage. It is interesting to dig into the song and see if it is about loyal love and friendship - or has its heart elsewhere. The song takes its mind away from obvious wording and clichés to present something quite homespun, quirky and interesting. Bring the Jubilee is a five-track E.P. defined by loyal bonds and standing up for someone. It does mention and cover love but never in such an obvious and uninspired way. The Ben Sparaco Band (as it were) is unified and tight throughout. The guitars are a blend of Country, Blues and Rock; the vocals have heart and soul but are primed and suited for the more gritty and raw end of the spectrum. It never cheapens the moments or makes it less genuine. It is a step forward from earlier tracks My Favourite Things and live examples of the E.P. tracks. It is clear touring and local gigs galvanised the band and led to some terrific studio confidence. Don’t Try to Wake Me Up has some of the more spirited and juggernaut components of Bring the Jubilee but there is a tonal shift. Things are more stripped back and there is a move from Country/Blues-Rock to Folk-Rock. That Folk element has not only defined the foundations but the lyrics too. The words are more compelling and direct. Whereas the E.P. mixed oblique and ambiguous: here, there are metaphors and similes but more direct focus and bare-boned sentiment. The vocals are more rounded: switching from the black-and-blue swagger of the earlier work but employing yellow, orange and blue hues. A broader emotional spectrum emerges and a more nuanced, deep and touching song with it. The production is sharper throughout and digs straight into the heart. Whilst barer and more lo-fi, it seems more professional somehow. You feel like (Don’t Try to Wake Me Up) is a live song but you can hear the studio quality. Sparaco is definitely committed to an album and the consistency needed to succeed. The E.P. was incredible and memorable but here Sparaco steps out on his own and really shines. A more level, complete and tender song: it never feels slow or less impactful. Don’t Try to Wake Me Up is Sparaco’s current single and a beautiful example of what Wooden is about. Starting with aching and yearning strings – in a way, I got visions of Small Faces in the initial seconds – there is a mix of Folk and Country. You never get the full, over-the-top twang and accent of Country (a little too sickly and southern) but not quite as restrained, acoustic and level-headed as Folk. It is a satisfying blend that creates an incredibly smooth and nourishing cocktail. Before a word is sung you are compelled by the sensual, evocative introduction that promises fine things. The hero is waking from bed to the sound of a knock at the door and a gentle woman’s voice. There is that scenery of sloth and inactivity: our man is very unwilling to budge and is being reasoned with. Perhaps there is heartache or aching bones; something weighing him down that is compelling him to embrace all the comforts of bed and sleep. In a way, the subject matter fits with a lot of Folk/Country songs and suits the tone of the composition. The way the vocal sound and is delivered reminds me a little of the late, great Leonard Cohen: there is no quite the low-down gravel and gravy of Cohen’s voice but something in the way it sounds that made me think of him. Whatever has inspired the song; you start to look at your own interpretations and views. Whilst the outside-the-door woman is stomping her feet and trying to rouse the defiant hero; he is committed to dreaming and trying to ignore the outside world. To me, the world and love have got him down. Things are moving too fast and there is, one imagines, a girl that might be playing on his mind – someone he is struggling with or perhaps let down by. Sparaco’s voice is never too heavy and wrecked; it is soft and compelling but still carries some scars and fatigue. Sparaco is an accomplished songwriter who knows how to keep a song interesting, unpredictable and appealing. As invested in the storyline as you are; it is the composition that steals focus towards the end. It is the final verse/words that really strike and unveil huge chunks of revelation. Our man wants the attention to go away and not be discovered. There are children involved – perhaps Sparaco speaking in third-person – and the suggestion of a ghost. The children will find where “their father needs to go” but there is the fear, when the door is opened, all but a ghost remains. It is a stark image and one that compels a few different interpretations. There is that familial suggestion and needing to escape; a young man that wants to achieve more and not satisfied with the world around him; a simplistic tale of someone not wanting to elude the comfort of his bed. At the very end, that repetition of “average day” sticks in the mind and will resonate with every listener. We have all been in the situation where what lie ahead holds no appeal or promise. In terms of Sparaco’s song; you feel like there is more at play and secrets he might be holding back. Perhaps there is some backstory and heartache but you are never sure exactly what. Perhaps that is the beauty of the song: there are no true answers but possibilities and what-ifs. Don’t Try to Wake Me Up might not be able to win every single person who prefers their music harder and heavier but that is okay – there are plenty out there who will fall for Sparaco’s music. He is not just reserved for lovers of Country and Folk: there is that variation and lack of borders that means his music will strike a chord with many hearts. Wooden will provide more sides of the story and reveal Sparaco’s true artistry and abilities. As it stands, Don’t Try to Wake Me Up is a fine song that shows how an everyday topic can, in the right hands, yield a lot more fascination than you’d imagine. Exceptional lead vocals – and some great support by his band of session musicians – and you have a single that singles the Nashville artist as one to watch in 2017. I am excited to see where he will go and how people will react to Wooden – an album that is going to be packed with delight and wonderful moments. Consider it allegory or beauty: Sparaco’s music is not easy to compare with others because it has that personal, unique affectation. There is universality to the themes and sounds but that extra ingredient that makes Don’t Try to Wake Me Up so enigmatic and seductive. Ross Holmes produced Wooden. He played fiddle and mandolin with Bruce Hornsby and the Noisemakers; arranged the strings for Mumford and Sons’ album, Babel. Some of the songs are Folk-Rock but others have Soul skin: Bluegrass lingers whilst Psychedelic-Rock shades make appearances. Before I go into more details about the album and Sparaco’s place in 2017 music, I wanted to return to my points about Nashville music, website/social media organisation and how undervalued maturity and originality are – and, of course, how 2016’s most-celebrated albums will have an effect on the new artists emerging. If we start with Nashville and one can easily discover hot talent and some fantastic music. New artists such as Wild Cub, Audrey Assad and The Vespers play here; as does Kate Arminger, The Weeks and The Delta Saints; Rachel Lynae and Tyler Flowers can go on the list too. Not only do these names help contextualise Nashville but demonstrate just what a variety of music is being played in the city. I know I long-bemoan the surfeit of attention certain areas are provided. British music media is too London-centric whilst the U.S.’ pages, for the most part, resounded strongest to the heartbeats of New York and Los Angeles. It has been the way of things for years based only on these grounds: they are two huge cities and has a cosmopolitan population. The argument dies there and many forget just how wealthy and vociferous other parts of America are. Nashville is as notable because of its music scene as Detroit, Seattle and Manhattan. The local (Tennessee) media is raising awareness but it would nice to see that reflected in the national media. No matter because with artists like Ben Sparaco pressing and rising from the trenches – surely his name will ascend beyond Tennessee-Florida-the South and see him demanded right across the country. His adaptable, chameleon-like musicianship means he could find fortune in polemics like New York and California but succeed in all sorts of musical geographies and conurbations. It all starts with awareness and activity: appreciating a fine artist and making strides to promulgate his abilities. I hope Sparaco can find some time and dollars to come to the U.K. and perform here. In this country, there are plenty of cities and towns that would welcome him in. Not only is London catered for artists as multifarious and away-from-mainstream-expectations as him but other areas. Yorkshire is giving birth to so many wonderful Folk artists and wonderful young talent; cities like Manchester and Liverpool are traditionally hospitable and welcoming; consider Scotland and locales Glasgow and Edinburgh. There are plenty of places around the U.K. that would love to hear Ben Sparaco and Wooden’s delights. I have talked about maturity and how it’s a commodity not appreciated by all musicians. I realise a slightly ingénue, child-like naivety – a kind way of calling someone moaning and hysterical – will be popular and connect with many. There will always be a place for acts who put their hearts on sleeves and let it bleed all over the floor. Björk was right: not only is it more interesting talking about something meaningful/original but those who do often have to fight for credit and equality (women especially). Don’t Try to Wake Me Up trades commodities like love and emotion but it is certainly not your average tale of woe and bitterness. Far from it, in fact. It is a song that hits you straight away but stands up across time – you will not tire of it and find something new to appreciate each time you come back. Despite Sparaco’s tender years, we have an artist who seems ready for the challenges ahead and already comfortably over the first few hurdles. The fact he takes a serious and dedicated approach to his music is mirrored in his online presence. The social media pages are a-flowin’ with updates and insights: the young artist always eager to keep his fans informed and let them know what he is doing. His official website remains one of the most characterful and memorable I have come across. Housed are all the social media links and music; the biography, photos and tour dates. That is what you want from a musician – so many negate this and provide very effete, sallow scraps. Rebus, romance and a business-like approach can be found on that homepage: it is an asset that will help recruit so many new fans and be an indispensable tool for any venues and promoters in this country. I shall leave those points alone because the most important thing is the music itself. Don’t Try to Wake Me Up is a fantastic track but joined with plenty of sibling support. The album is something you will want to get hold of. Wooden confirms what a consistent and strong songwriter Ben Sparaco is. If you are a fan of his previous E.P. and the rousing Blues numbers then you will not be disappointed but there is more emphasis on the classic songwriting playbook the likes Neil Young and Bob Dylan penned in the 1960s and ‘70s. The lyrics are no less evocative and scenic; the characters, emotions and performances just as personal, emotional and open. That is not to say Wooden is a sombre and low-energy album: it has plenty of rouse, swing and spirit when required; songs that paint very ornate, beautiful pictures; moments that impress and amaze in their candour and literary imagery. Nobody will be able to hear the album and not be amazed. I am judging my review/sentiments on the few numbers I have heard.